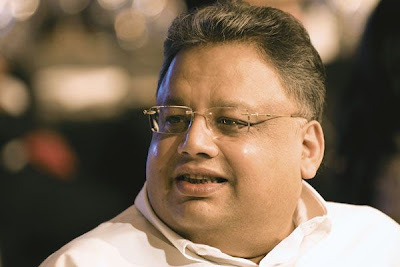 Rakesh Jhunjhunwala, Chairman, Aptech Ltd.
Aptech Ltd’s (BSE: 532475, NSE: APTECHT) promoter and Chairman Rakesh Jhunjhunwala on Thursday, 10th May 2012, acquired 10.95 lakh shares, while The Royal Bank of Scotland sold 9.79 lakh shares, in deals executed at NSE. This was disclosed by National Stock Exchange after trading hours on Thursday. The ace-investor-turned-promoter of the leading training solutions firm upped his stake by 2.24% through this deal. As of Q4 end, the promoter group led by him held 35.79% in Aptech. The buy worth Rs. 7.71 crore seems to have surprised the market, as the promoter group had reportedly been on the look-out for a suitable buyer for their stake, for some time now. The matching seller on Thursday, RBS, held 2.01% stake as per the latest SHP, which they have sold off fully on Thursday. Apart from Royal Bank of Scotland, there is only one major institutional investor in Aptech, holding more than 1% stake. It is the DII, Religare Finvest, which held a significant 3.41% stake as of Q4 end. On Thursday, Jhunjhunwala’s buy was at Rs. 70.44 a share, while RBS’ sell was at Rs. 70.25 a share. RBS had acquired 4.5 lakh shares at Rs. 135.43 a share, through an identified deal in July 2010, and seems to have accumulated at lower levels later on. On the financial side, Aptech has been faring reasonably well on the profits front, while struggling to grow its revenues. In FY’12, while consolidated profit jumped by over 75%, consolidated revenue could grow only by 1.92%. This challenging situation in the topline growth is despite its dividend income growing by over 62%, which shows that the main challenge is with the standalone topline and the revenue growth of those subsidiaries clubbed with it. Consolidated revenue from operations have fallen by 8.56%. In contrast, returns from its minority subsidiaries or investments have performed well. Through a subsidiary company, Aptech owns 22.4% stake in China’s BJB Career Education Company Ltd.
At the fundamental level, the challenge with Aptech Group is that it has a diverse structure spanning retail and corporate businesses, as well as Indian and overseas businesses and investments. Its retail divisions follow the franchising model and includes Aptech Computer Education, Arena Animation, MAAC, Aptech Aviation & Hospitality Academy, Aptech Hardware & Networking Academy, Aptech Worldwide, and Aptech English Learning Academy. Its corporate businesses are Aptech Training Solutions, Aptech Testing & Assessment Solutions, and Aptech Learning Services. The consolidated company’s valuations can improve if the key Chinese company where it has invested in goes for its IPO. But despite plans and filing for the same in NYSE, around a year back, BJB didn’t execute it and let the filing expire. The challenge facing the core operation is evident from the fact that if not for the strong surge in dividend income, consolidated operating profit has more than halved in FY’12. Due to the headwinds facing the core operations, Aptech stock had fallen much in the year-to-date, from its 52-Week High of Rs. 147.90 on 29th July to a recent new 52-Week Low of Rs. 64 recorded on Wednesday, 9th May. It is noteworthy that the sell by RBS and buy by the promoter has come at this stage. Despite the fundamental challenges facing the company, the market is likely to appreciate the promoter’s renewed commitment towards Aptech as reflected by this buy. It is also evident that, even if they sell out eventually, the promoter group will be looking at much better valuations. Aptech stock rallied on Thursday and closed trade in NSE at Rs. 73.55, up by 11.1%.